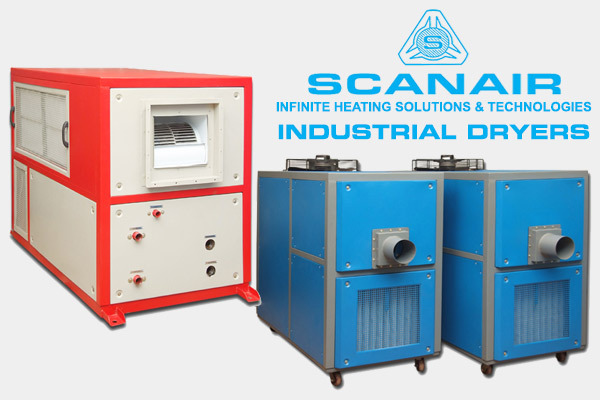 The principle of operation for drying in conventional industrial dryers can be divided in two parts. The first step concerns fresh outdoor air that is being brought inside the dryer and heated. Secondly, the air is circulated over the wet product. During circulation it picks up moisture from the wet product due to which its humidity increases and its air temperature decreases. The energy contained in this stream may make it a useful heat source. Standard procedure is to exhaust this used air or dehumidify it. 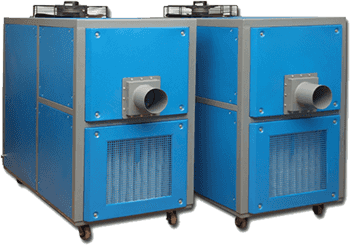 Most of the humid and cold air is re circulated when the innovative heat pump application is used. The air is cooled below condensation point and thus dehumidified at the evaporator of the heat pump. The pressure and temperature of the refrigerant (which is high in energy due to the extraction of heat at the evaporator) are increased with the use of a compressor. This energy is released into the fresh dryer air, at the condenser side. Due to the application of a industrial heat pump dryers, considerable energy savings can be obtained. Furthermore, the drying process is less influenced by outdoor air conditions. A more stable drying process increases the quality of the product. Industrial Dryers are widely used in food grains processing, storage and preservation. The recommended duration of dryers in warehouses is according to the temperature and moisture content of the grain. The temperature depends not only on climatic conditions but also on the biochemical changes that are produced inside a grain mass, provoking undesirable natural heating of the stored products. As for the moisture content of the stored grain, it depends on the relative humidity of the air with relative air humidity below 65-70 percent; many grain-degradation phenomena are slowed down, if not completely blocked. In this sense, the “safeguard” moisture content is defined as that corresponding to equilibrium with the air at 40-60 percent relative humidity. Like grain, micro-organisms and insects are living organisms that need oxygen storage of grain in places that are low in oxygen causes the death of insects, cessation of development of micro-organisms, and blockage, or slowing down, of the biochemical phenomena of grain degradation. This favours the conservation of grain, but may affect its germinating power. Industrial Dryers plays a major role in food preservation, where the principal enemies of stored grain are micro-organisms insects and rodents, Micro-organisms (moulds, yeasts, bacteria) are biological agents present in the soil which, when transported by air or water, can contaminate products before, during and after the harvest. Their presence and growth cause severe changes in the nutritive value and the taste, smell features of grain in the case of moulds, for the potential formation of dangerous poisons Impurities, and cracked or broken grains, foster the development of micro-organisms. Furthermore, temperature and humidity have a determining influence on the growth rate of these degradation agents. It has been observed that micro-organisms develop at temperatures between -8°C and +80°C, when the relative humidity of the air is over 65 percent and atmospheres that are low in oxygen help of long storage of seeds.Insects can live and reproduce at temperatures between +15°C and +35ºC low humidity slows or even stops their development, and a low supply of oxygen rapidly kills them.